Is tonic water healthy? It sounds like it should be because it has "water" in the name. But tonic water is more than just water. Tonic water has a bitter taste that comes from quinine. Quinine is a natural substance found in the bark of the Peruvian cinchona tree, high in the Andes mountains. All tonic water brands contain quinine, but the amount may vary from brand to brand. Most brands also contain natural or artificial flavors from fruits or herbs to temper the bitterness. Tonic water calories are surprisingly high. This popular mixer is loaded with 124 calories per bottle. So what's in tonic water that makes it less healthy than sparkling water or mineral water? The reason that tonic water is relatively high in calories (compared to calorie-free sparkling water or club soda) is that it contains a sweetener in some form. Some brands contain high fructose corn syrup, while other brands include cane sugar or simply sugar in the ingredients. When you add an alcoholic ingredient, like gin, to make a gin and tonic cocktail, the calorie count can increase to 200 calories or more per serving. Tonic water can also be a source of sodium, depending on the variety that you buy and the amount that you drink. Seagram's brand tonic water, for example, provides 20 milligrams of sodium per serving; Schweppes brand tonic water provides 55 milligrams of sodium per serving. So is diet tonic water any better? Not all brands make a diet version of their popular mixer. But you'll eliminate the calories if you can find and use the diet variety. The diet beverages don't contain sugar. But you may consume more sodium. Schweppes Diet Tonic Water, for example, contains 105 milligrams of sodium, almost twice as much as the regular version. The calories in tonic water come from sugars. There are 33 grams of carbohydrate and 32 grams of sugar per serving. The estimated glycemic load of tonic water is estimated to be about four. There is no fat in tonic water. You won't gain any significant vitamins or minerals when you consume tonic water, however, there is a small amount of sodium, zinc and copper. Quinine, a key ingredient in tonic water, can be used to treat malaria. The substance is FDA-approved in specific doses to treat the disease. But the amount of quinine in tonic water is less than what is generally prescribed for medicinal purposes. Some consumers have also tried to used quinine for leg cramps. But the FDA has warned that this off-label use is not recommended and may cause harm. And finally, some drinkers may use tonic water to relieve stress. Tonic water is often combined with gin to make the popular gin and tonic cocktail. While drinking alcohol in moderation may be safe, drinking too much or too often can cause harm. What are the most popular tonic water alternatives? 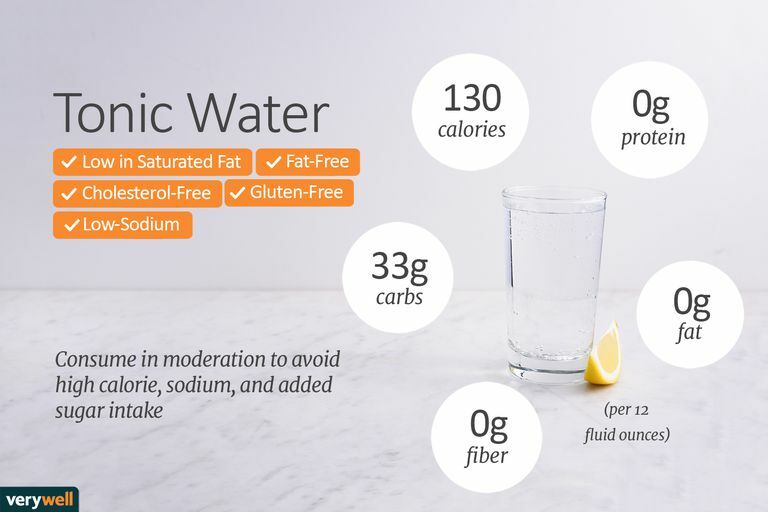 If you enjoy tonic water plain or as a mixer, you may want to try one of these water alternatives to cut back on calories, sodium and added sugar. Seltzer. Seltzer is plain water that has been carbonated. It is very similar to club soda. It contains no calories and no added sweeteners. Add lemon or other fruit for flavor. Plain water. Plain water doesn't provide any bubbles but many people top off their favorite liquor with water instead of high-calorie mixers. Mineral water. Mineral water tastes very much like seltzer but the carbonation is usually natural. What is the best way to store tonic water after it has been opened? Whether you use tonic water or sparkling water, you'll want to keep your bottled water tightly capped and chilled so that the carbonation is maintained and it is always ready for your cold drink. Most people use tonic water when they prepare adult beverages, most notably the gin and tonic. G and Ts as they are often called are a mix of gin, tonic, ice and lime. Usually, fans of the drink purchase tonic water at their local market as almost all grocers carry the soft drink. You can make also your own tonic water. There are countless online recipes to try if you prefer craft-style beverages. Try experimenting with different herbs and flavors. The tonic water you make at home may or may not be lower in calories than the store-bought brands, but you can at least control the ingredients to create a beverage that caters to your personal tastes, such as a Low-Carb Sugar-Free Sweet Sour Cocktail. It is possible to have an allergy to quinine that may cause a reaction if you consume tonic water. According to one published report, allergic reaction may cause thrombocytopenia (blood disorder), neutropenia (hematological disorder), anemia, clotting disorders, acute renal failure, liver toxicity, and neurological abnormalities. Another case report links allergic reactions specifically to tonic water. If you consume tonic water or if you suspect an allergy to tonic water, seek care from a qualified medical professional. Howard, M. A., Hibbard, A. B., Terrell, D. R., Medina, P. J., Vesely, S. K., & George, J. N. (2003). Quinine allergy causing acute severe systemic illness: report of 4 patients manifesting multiple hematologic, renal, and hepatic abnormalities. Proceedings (Baylor University. Medical Center), 16(1), 21-6. Winter F. D. (2015). Immune thrombocytopenia associated with consumption of tonic water. Proceedings (Baylor University. Medical Center), 28(2), 213-6.